When we were in England at a summercamp with Dogs for life and Philippa Williams a couple of years ago we did a lot of ”walking on a line” or rather a “walk up” because that’s what it is called. 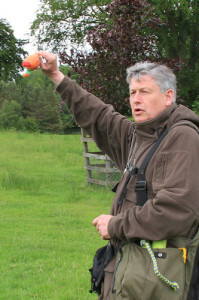 It is one way to hunt and the dogs and handlers walk on a long line a little bit behind the shooters, thus they help to toll the game so it can be shot. No game was shot this summer instead there were people with dummy throwers and dummies on the different ends of the line. 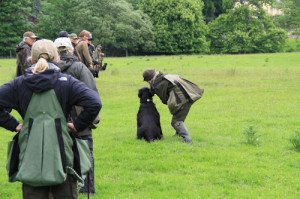 We trained to send the dogs along the line to fetch blind retrieves and blind retrieves at the other end of the line. 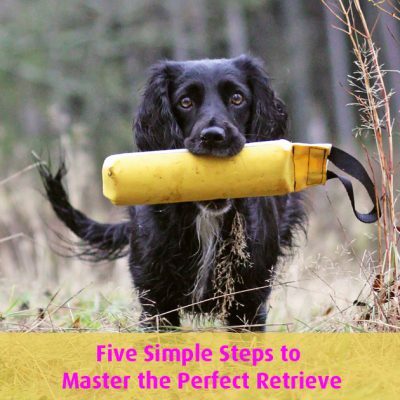 The idea is that the dog should learn to use the line as a support and run along it, and then continue in the same direction as the line until the dog can scent the dummy or game she is supposed to fetch. 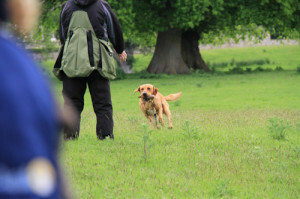 During a hunt the retrieves will land in front of, behind, and next to the line, and usually it is very difficult for the dogs to fetch game next to the line. 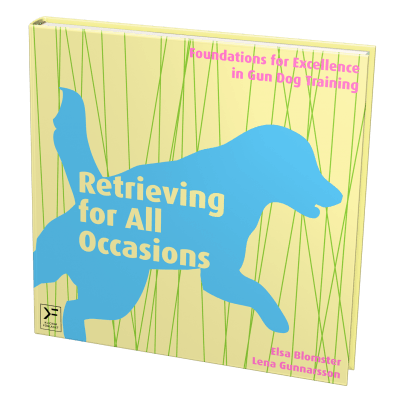 Therefore, we trained just that and not to fetch retrieves in front of the line. 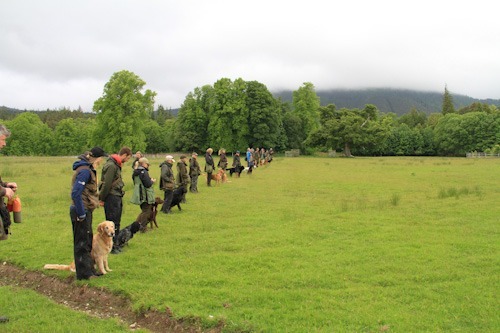 This is a straight line (we were probably 20 dogs and handlers on the line, so it was quite long). Now the line is becoming slightly bent, but still rather straight. If it were completely straight the person next to my right side would only have seen me and not the other people on the line. 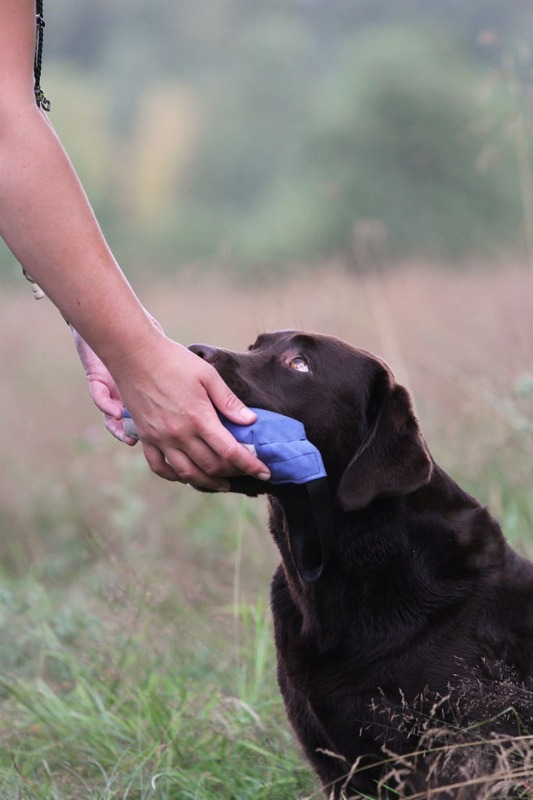 Those dogs that were not yet ready to carry dummies could fetch other items, such as small soft toy animals. 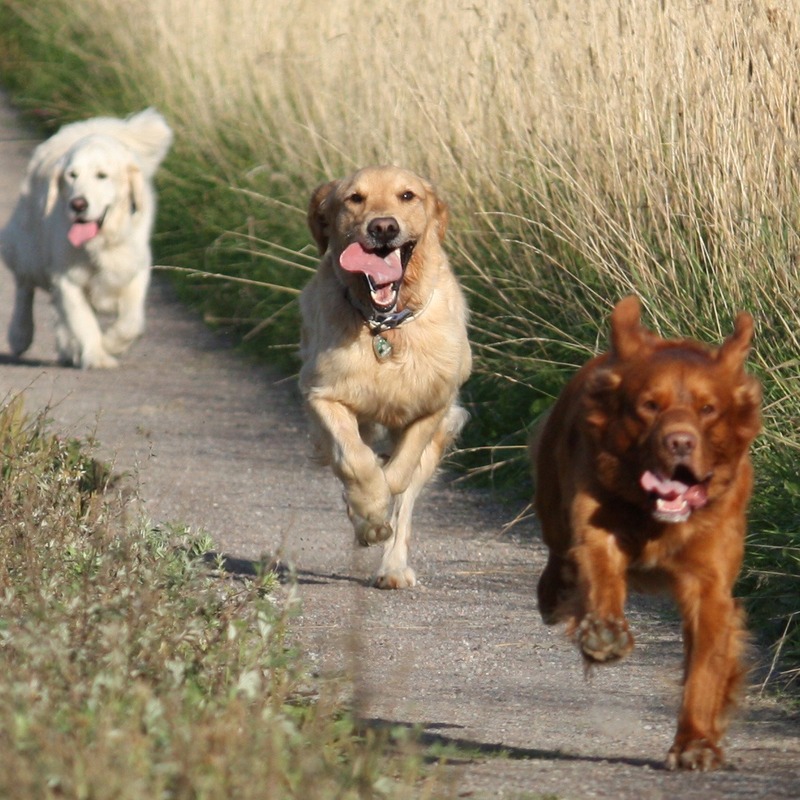 The younger dogs walked in the middle so that they only needed to run half the way, while the more experienced dogs were placed at the edges of the line, so they had to run along the entire line. 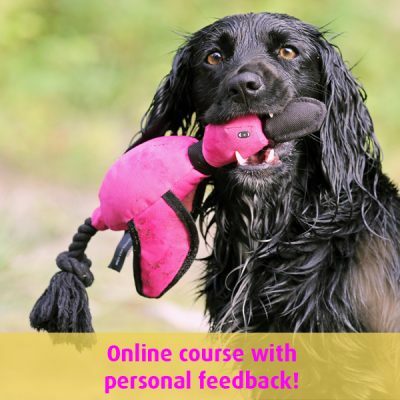 When it wasn’t my dog’s turn to fetch something I had a great opportunity to train heelwork, both to walk straight forward and to turn around and follow the handler so the dog had a chance to see where the dummies fell. 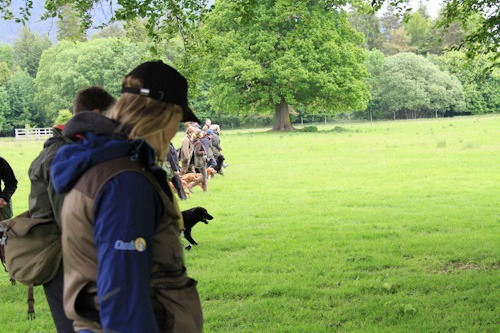 It is important not to walk too far behind or in front of the line because then you might be in the way for the handlers who want to send their dogs (or if it had been a real hunting situation, you would have been in the way of the shooters). When it is your turn to send the dog you should take one step forward and then you send your dog. 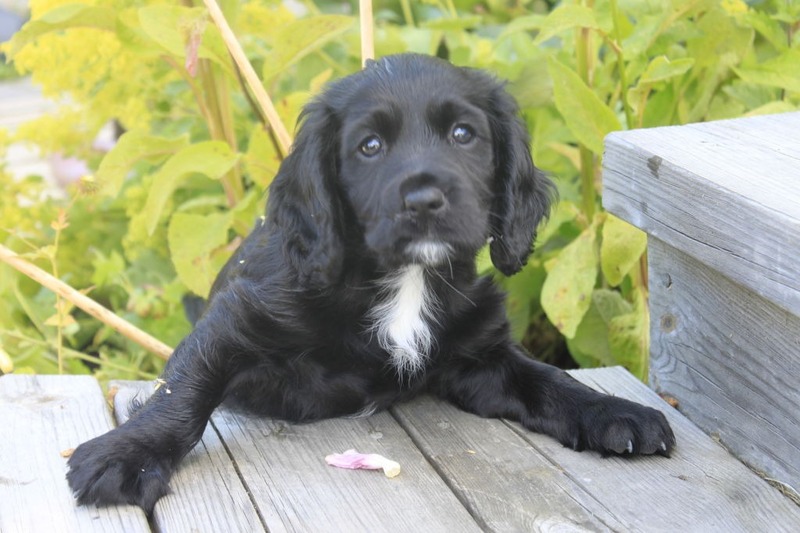 It is also important to stand a little bit in front of the line when the dog is on her way back to you so that she can see where she is supposed to run.